Spotted a female cherry barb this evening with white tips on the dorsal, pectoral and pelvic fins. The dorsal definitely seems like there's a bit missing when compared to the other three females. No other fish have any apparent symptoms. I have ordered some Esha 2000 on fast delivery. I should be able to dose from friday evening. Best photo I can get. Any opinions and advice are most welcome. Re: Cherry barb - Finrot? Sorry to read and see this, Paddy. I'm picking this up on my phone, so can't see pic in focus, but description certainly sounds like finrot. Water quality [ my definition ] is paramount in these circumstances - try to keep nitrates under 20, as well as ammonia and nitrites at 0. An extra water change would be a good plan, either tonight or tomorrow. eSHa 2000 is good, or Waterlife Myxazin if you can get hold of that tomorrow to start treatment sooner. Don't use both concurrently, though. It looks like finrot to me @Paddyc . I'm sure your water quality is fine but just double check it. You're options are transfer the fish to quarantine and treat it or treat the whole tank. If you treat the whole tank the snails should be ok, I've treated with eSHa 2000 with snails and shrimps in situ with no problems. If you find the snails hugging the top of the tank whip them out and stick them in your spare tank. They're more likely though to hide in the substrate. I recall you have a plec so because they have skin rather than scales you might be better going for a half dose if you treat the whole tank. Hope that helps...don't panic btw everything gets ill at some point. If you've had hot weather up there its enough to change the situation and increase the potential for bacterial or fungal infection. I've received my esha 2000 tonight when I got home, no way was my missus comfortable to open it and read the instructions and dose the tank for fear of anything happening. So I'm working out my dosage. If this helps your partner get a better sleep tonight / reduce her anxiety levels, then she may be relieved to know that the instructions for eSHa 2000 actually suggest doubling the dose for soft water of GH <4 which I think your water is. However, I don't recommend you do this, and think the suggestion of doing half of the standard dose is a really good plan ie 22ish drops. Hopefully this is reassuring. Hope your barb is better soon. Half dose seems like a good idea to be on the safe side. Ok I dropped the bottle in the tank!!! Nobody panic... At the most it could only have added two to three drops to the 22 I added... It landed on th bottom bolt upright and no leakage... I quickly retrieved the step ladder and fished it out. Snails haven't made a bid for freedom yet and it's been over 40 mins. Heart leapt right into my throat though, thought I'd poisoned the tank!!!! Your first line caused my heart to leap into my throat too! Glad to hear all's ok. If in doubt, or any adverse signs, water changes are the solution. Always best to do these things away from the tank, as mistakes are easily made when stressed/nervous such as in these circumstances. @Paddyc Holy Pants Batman, glad the bottle landed upright and you managed to get it out of the tank quickly. I hope that everything is ok this morning. The snails don't look any different, still going about their business as usual. I've checked the rim of the tank, no escapees... And the plec is no different either. Feeding time is at lunchtime so will see if my poorly cherry has some grub. I'm keeping my fingers crossed for the cherry barb. Someone once commented that 2 things will survive a nuclear holocaust - cockroaches and malaysian trumpet snails. They should be OK with the medication. I have ramshorns and 'pond' snails survive overdosing whitespot medications (two) and 3 ppm ammonia being added to the tank. The problem with eSHa meds is they are dosed by drops squeezed from the bottle. I suppose a way to add it would be to drip it into a tub then rinse the tub in the tank to get all the med out. I had already decided that tonights dose (12 drops since I estimate that 24 drops went in last night, 22 deliberately and maybe 2 unintentionally!!) will be added to a paper cup of tank water then poured in and swished in more tank water. I have hundreds of paper cups. There's always something to learn, isn't there!!?? Cherry barb has her appetite back!! She still isn't as sprightly as the other ladies but she definitely got a fair share of the food. I sunk some pellets in a cup of tank water and poured it in for her as she is still very cautious of coming to the surface where the mad scramble happens. I'm happy now. I will complete the course tonight and tomorrow and see how things improve. Do I need to remove the meds once all is well again? Some meds say they degrade after a few days but I can't find anything like this on the eSHa 2000 leaflet. When it doesn't say, I usually do a big water change then run some carbon; a couple of batches changing the first one after 2 days. I use a small cheap internal kept in the cupboard for this purpose. Yeah I couldn't see anything in the leaflet that says to remove it or not. It seems to be a complete treatment that you can use on an ongoing basis. Since I am carrying out a 3-day 50% dosage course I will just do 2x40% water changes on days 4 and 5. Then back to weekly 60% water changes. So glad to hear that your cherry barb had her appetite back. Glad that things are looking up. As you're planning, do finish the treatment course, even if she looks in wonderful form tomorrow. I'm glad the barb is perking up and I'm also very lazy and generally don't do anything to remove eSHa 2000 after treatment unless there's shrimp in the tank, done on the basis that it doesn't actually recommend you actively remove it after the final dosage (I'm happy to be corrected). I just do the normal water change routine. Cherry barb is eating but still not 100% based on the clamping of fins. The white furry ends of the fins has all but disappeared. I might still try to catch her and stick her in the 3 foot tank which I have kept going with 2.5ml ammonia every 2-3 days. Then I can hit her with a full dose of esha 2000. If the fluff has gone the meds are working, you'll probably need to extend the half dosage until you've done a full dosage iykwim. I don't know if you do this but you could also try feeding with some defrosted frozen bloodworms. It's how you condition fish to build them up for spawning, the barb would effectively get a dietary boost to help it recover. @Paddyc I think you'll find that @Fiona is right rather that psychic - that's women for you. Glad to hear that all the fish, including the cherry barb, enjoyed the bloodworms. @Paddyc I think you'll find that @Fiona is right rather than psychic - that's women for you. Provided you feed a wide variety of frozen food, that should be OK. The danger comes from feeding just one or two as they can't contain all the nutrients that fish need. Bloodworm, for instance, should only be fed once a week as it is very fatty. That will last me a while then, 30 pieces in a slab of it. P@H do individual slabs at £3 each of 5 for £10... I might stock up at a later date and give the fish a more varied diet. Is there any merit to using flake vs micro pellets as these are the staple for the fish at the moment. Flake and pellets are formulated to give a balanced diet, the main difference is getting it to the fish. Surface dwellers need flakes as they float, bottom dwellers need pellets as they sink. If all your fish get some food, use the one you have. I should add that there are some fish that do better with specialised food as their nutritional requirements need something a bit different from standard flakes/pellets. For instance, algae eating fish need a food with a higher veg content, and carnivorous fish need a food with a higher meat content. 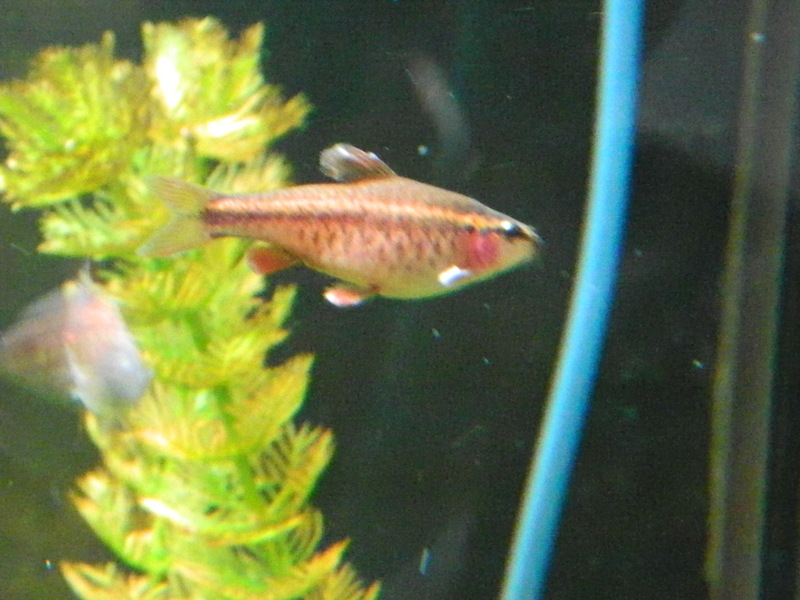 Topics that relate to "Cherry barb - Finrot? - eSHa 2000"